Visit the cities of London, Canterbury, Dover, Normandy, St. Malo, Chartres, Paris and Amsterdam. Visit Windsor Castle, Canterbury Cathedral, Cross the English Channel, the Normandy Beaches, St. Vincent Cathedral, Versailles, see the Eiffel Tower, Notre Dame, Fragonard Perfume Factory. Take a train to Amsterdam where you will see the Royal Palace and Westerkerk and visit Anne Frank’s House and much MORE! The cost includes: Round-trip airfare, Lodging at hotels, Full-time Tour Guide who will be with us from the time we arrive until we depart, Breakfast & Dinner, Admissions, and more. Open to students 6th Grade and up and parents. If you do not have a passport apply as soon as possible. 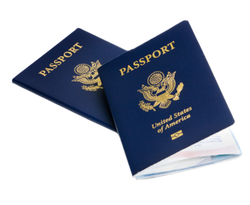 You need a Passport Book, you cannot use the Passport Card to fly to Europe. ​please talk to Mrs. Truitt OR email: truittl@svsd410.org.